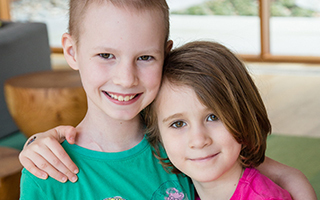 Help keep seriously ill children and their families together when it matters most. You will receive your charitable tax receipt by email. *If you are donating on behalf of your company, please click here. Your gift provides a precious moment: a family meal, a bedtime story, or playtime with siblings. Your gift provides one night’s accommodation for a family, keeping them close when it matters most. Your gift keeps a family close for two nights and gives children space to play between appointments. Your gift provides 4 nights of accommodation and access to wellness programs for kids and adults. Your gift keeps a family together for one week in our home away from home. Your gift will help us serve up to 2,000 families each year in our 73-bedroom House. Please enter your address exactly as it is shown on your credit card statement. Questions? Want to donate by phone?